Floral foam has been a trusted friend of the florist for so long and if it wasn’t SO bad for the environment, it would be a great product. Many beautiful pictures of arrangements you see on Pinterest, giving the illusion of wild, long-stemmed flowers falling in different directions have been held in place by foam. But more and more, I have seen florists that I follow on Instagram and talk to in floristry groups on Facebook, throwing away their foam and replacing it with more eco foundations for their beautiful creations. 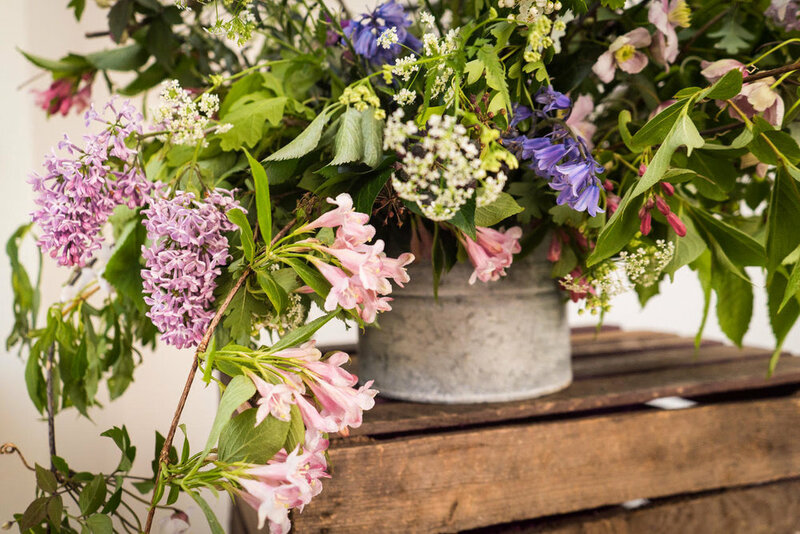 Last week, florist Philippa Craddock showed the world, that even on a grand scale like a royal wedding, it’s possible to go floral foam free. This was a strong and exciting message and one that I think will have a really positive effect on the industry. Hopefully, for such a public wedding to be foam free, it can open up the conversation with bride and grooms and will make it easier for florists down the chain to propose more eco designs. I'm still learning all the techniques so when I went foraging the other weekend I tried out different ways of replacing foam. I used chicken wire and moss to hold the stems in place, (you can see a photo of that on my insta feed here). Along with the fact you’re doing something positive for the environment, a change like this is great for creativity. Working to different guidelines can encourage you to look at a project differently and come up with new ideas and shapes - and that’s never a bad thing! British grown flowers, foam free arrangement. CUSHIONS ARE FOR COMFORT, NOT BUSINESS ADVICE.